Naturally-sourced, complete nutrients from whole food have been found to be much more beneficial to us than synthetic supplements. Many people are discovering the amazing benefits of seaweed and algae as a complete, natural nutrition supplement for the whole family. I sneak it into everything you can imagine, from soup to spaghetti sauce. With 93 identified nutrients, even synthetic supplements can’t come close to the variety, amount, and bio-availability that seaweed offers. However, most people have limited their supplementation to Kelp and/or Spirulina in the belief that seaweed is seaweed. That couldn’t be further from the truth. We consume (and feed our pets) a premix of balanced powdered or flaked seaweed because each species offers it’s own variety of nutritional and natural healing benefits. Individual seaweed species can be higher in protein or specific nutrients. For example, all seaweeds contain chlorophyll, but there are different types of chlorophyll. Green seaweed species contain chlorophyll A and B, red seaweed species contain chlorophyll A, and brown seaweed species contain chlorophyll A and C. Colour is only the beginning of these variations, however, as nutrient content and levels vary amongst species as well. Chondrus crispus is used to build immunity and prevent viral diseases, including the treatment of TB. The large brown seaweeds known as “Kelp” are rich sources of alginic acids, which remove heavy metals and radioactive isotopes from the body. Polysaccharides in red seaweeds also offer detoxification. An example of the unique benefits found in each seaweed species or variety was recently demonstrated in a Georgia Institute of Technology study. And we still don’t know the half of it! Therefore, to receive maximum benefits, we cover all our bases with a good premix of several species of green, red and brown seaweed/algae. Green Seaweed – May include Sea Lettuce, Spongeweed, Ulva, etc. There are approximately 4,500 wild green seaweed/algae species. Red Seaweed – Dulse, Nori, Laver, Irish Moss, Carrageen, etc. There are approximately 6,500 species of wild red seaweed/algae. Brown Seaweed – Kelp, Wrack, Bladderwrack, Wakame, Kombu, Fucus, etc. There are approximately 1800 wild brown seaweed/algae species. 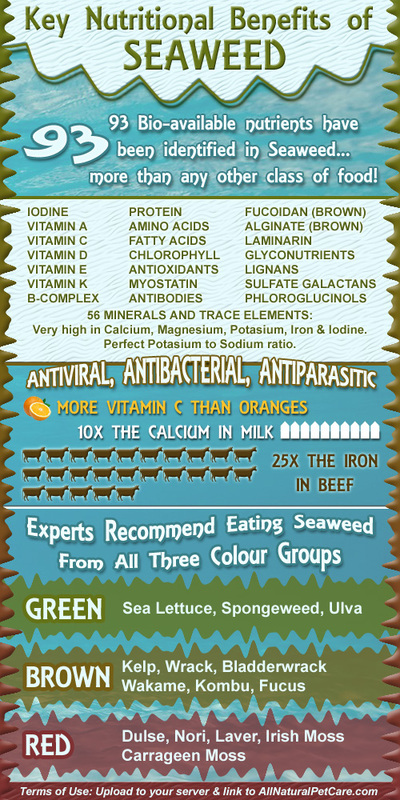 Following is an infographic that illustrates the many nutritional benefits of spectacular seaweed/algae. It’s perfect for saving as a quick-reference guide or for sharing on social media. Do you use seaweed/algae as a supplement or nutritious seasoning? Please share your experiences in the comments below. 2 Responses to "Mix Seaweeds for Max Benefits (Infographic)"
I’ve been eating dulse by the bag for years and my mother did too. She lived to be 97 so maybe there’s a connection. I didn’t give much thought to other kinds of seaweed but I’d love to try some more. Thanks for the tips.